EatBreatheYogini nominated Turning Veganese for a Very Inspiring Blogger award and we are inspired and flattered. There’s really nothing better than getting some attention from other bloggers whose work has inspired us. 2. I spent a lot of time working on a farm growing up; I ate a lot of vegetables. 3. Brent was vegetarian at various times during high school and college, but was shamed back into eating meat. 4. My first day being vegan I failed miserably and forgot that meatballs were meat. 5. Brent’s favorite vegan food is a giant burrito wrap from a local joint that includes black beans, quinoa, Daiya, soy chorizo and other awesome sauce, smothered in sriracha. 6. My favorite vegan food is pomegranate. It was my favorite food before I was vegan. 7. Brent delights in making tofu with our TofuXpress. He’s a visionary. His kung fu… er tofu is the best. 1. natsukashii details the journeys of a mom, vegan, and just about every other identity a woman can have. It’s compelling stuff and it makes me tear up at times. Two Vegan Girls is a tumblr blog with awesome quickies about veganism. Sometimes they post from natsukashii (a sister blog) and it’s a bigger adventure. 2. Everything Vegan Monologue makes is mouth watering. Definitely give it a look. 3. 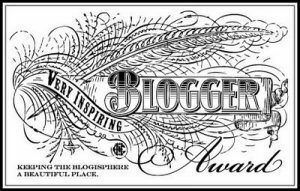 Live Blissful has already been awarded the Very Inspiring Blogger award but this particular work inspires me. Thank you! 4. Bacon is NOT an Herb always has something fresh to offer. This blog also makes me miss the Northeast. 5. The Cruelty-Free Review is indispensable. Check it out. 6. Girl Sounds focuses on something else I love: art. Sometimes there’s food too… I like food. 7. Canned Time has already been nominated for this award but they inspire me. Deal with it. Congratulations – and great blog selections! Congrats on the award; you deserve it! And thank you so much for the nomination! I’m so sorry I just noticed it; I’ve been getting back into the work routine so my computer time has been lacking. Great blog suggestions; there are a few I haven’t read and am easger to check out!